Since my focus over the past few posts has been on Divine Healing, I cannot leave the subject without considering the one question that is always at the forefront ... How are we to think about Paul's "Thorn"? This question came up in our Home Church meeting on Healing, and continues to be a source of debate between my faithful friends. 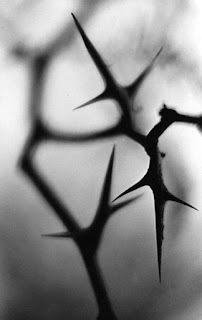 What do we understand the thorn to be, and why wasn't Paul healed of it, are at the center of our discussion. Right off the bat, I will tell you that it is difficult to discern with any certainty, what Paul's thorn is -- although it is clearly sent by Satan to harass him. Some have seen it mainly as spiritual harassment. Others have thought it was persecution. Many have suggested it was a physical or mental ailment. Some have said this was Paul’s struggle with lustful and sinful thoughts. Early Christians, such as Tertullian, thought it was an earache or headache. I've also heard everything from malaria to a nagging wife. You can see how easy [and distracting] it is to focus on this mystery. And there are those who will point to what they call the "First Mention Principle", which says in order to try to understand the Bible systematically, theologians and philosophers have developed the study of hermeneutics, which deals with the general ways for interpreting Scripture and other written texts. But it is important to consider that the First Mention Principle is just one of the many hermeneutical techniques that exist in order to interpret the Bible. If you want to consider this technique, then you would look at Numbers 33:55, which is the first mention of the word "thorn" in the Bible, and it reads: But if you do not drive out the inhabitants of the land before you, then those whom you allow to remain will be irritants in your eyes and thorns in your side, and will cause you trouble in the land where you will be living. Here, "thorns" refers to the "inhabitants of the land". Or you can take a look at Joshua 23:13, which reads, know for certain that the Lord our God will no longer drive out these nations from before you. They will trap and ensnare you; they will be a whip that tears your sides and thorns that blind your eyes until you disappear from this good land the Lord your God gave you. Again, "thorns" refers to "the nations" or people. But I have to be honest -- it doesn't really matter to me what the thorn is. And I think it is rational to surmise that God made the thorn intentionally vague; it was an instrument by which Satan could harass Paul, and God wants us all to be able to put ourselves in Paul's shoes. We are all going to face harassment by the Enemy at some point in our lives -- especially if we are doing Kingdom work, as Paul was. So, I have been trying to figure out the overall view that God wants us to take away from this passage. In doing so, I have come across another stumbling block that Christians have when trying to understand Paul's position towards Satan's harassment or oppression. Depending on which version of the Bible you are reading, verse 9 reads either, I will boast all the more gladly of my weaknesses, or it reads, I will boast all the more gladly of my infirmities. This adds to the confusion over what "the thorn" is, and while it is another fly in the ointment, so to speak, if you like to deep dive into the Bible, it is interesting to see where it takes you. I will say that most of the versions I have read (ESV, Amplified, New American Standard, New English Translation, for example) use the word weakness. But the King James, New King James, and Geneva Bible all use infirmities. But it is interesting that there is a notation in my King James Bible that says "infirmities" means "weakness". And when you go to Strong's Concordance, you can trace the origin of the word "infirmity" from meaning "lacking strength, weakness, infirmity"(769); back to "strengthless" (772), and all the way back to its roots of "to strengthen or confirm in spiritual knowledge and power" (4599) and "to make to stand" (2476). Can you see where the confusion comes in? But I also see where these meanings can also help form our understanding of the passage, as you will see in the ensuing paragraphs. I have really been trying to understand what God is telling us all in this oft-quoted Scripture. And I'm pretty sure that how each Christian interprets this verse will depend on their view of God. I want you to read that last sentence again ... how you view God will determine what 2 Corinthians 12:7-10 means to you. If you believe that God is in control of everything, then you are probably going to think that God has decided (for whatever reason) to allow Paul to continue to suffer with his thorn. And verse 9 will mean [to you], that God is saying whenever He doesn't take away your suffering, then His Grace (lovingkindness and mercy) will be enough to get you through. You might read the rest of that passage to indicate that Paul is accepting his suffering as a testament to his faith in Christ; that he is content to show that by suffering (being weak), yet still holding on to his faith and enduring, he is a picture of Christ strengthening the faithful through diversity. There is no doubt about it... Paul is desperate to have this thorn (burden) taken from him. Three times he pleaded and prayed to God to take it from him. God obviously did not stop Satan's harassment, so what might His purpose have been? Once again, if you believe God controls everything, you might understand verse 9 to mean that God would strengthen Paul to bear the burden of Satan's attack; that God would strengthen Paul under it, and God would show His strength through Paul’s apparent weakness. And this is certainly a valid interpretation, based on this particular passage. But let me give you an alternative view. What if your view of God is that He is not in control of everything? What if you look at this passage in the context of the Authority and Power given to us by God? What if God is saying that each us has a choice [through our free will]. We can accept the attacks (thorns) of Satan and endure them for the sake of our testimony that it has strengthened our faith that Christ has the power to uphold us during our suffering ... in that case His Grace will be sufficient and enough to get us through those events. OR, might we have another choice? I present to you [for your consideration] the Greek translation of 2 Corinthians 12:9-10 ... And He said to me, and His declaration still stands, My grace is enough for you, for power is moment by moment, coming to its full energy and complete operation in the sphere of weakness. Therefore, most gladly will I rather boast in my weaknesses in order that the power of the Christ [like the Shekinah Glory in the Holy of Holies of the Tent of Meeting] may take up its residence in me [working within me and giving me help]. Therefore I am well content in weaknesses, in insults, in necessities, in persecutions, and in circumstances under which I am subject to extreme pressure on behalf of Christ. for when I am weak, then I am filled with ability and power. In full disclosure, my view of God has changed and grown exponentially through the ministry He has called me and husband to do on behalf of His Kingdom. But I am not saying that my view of this passage is the correct one. I am merely sharing what my spirit is telling me is a possible interpretation. Since I definitely believe that we have been given Authority by Christ to use His Power [that comes from God] to heal the afflicted, that authority and power also extends to healing ourselves. This is where my view of God comes into play. What if God is saying this: Paul, you have been given free will to deal with this thorn yourself. You don't need to keep asking me to remove it for you. You can endure it for your testimony of the power of Christ to strengthen you through your ordeal. In that case My grace and mercy will be enough for you. But, you don't really need to keep asking me to heal you [you've asked three times, and there's a reason I haven't responded] ... I want you to know that you have been given the Authority and Power to command your own healing. I have given you the very power that I showed in the Holy of Holies! And that power is available to you moment by moment, having taken up residence in you, and you can call on it whenever you need it. So, Paul, when you're feeling harassed, insulted, persecuted or oppressed by the forces of the Enemy -- when you're feeling weak, stop and realize you are filled with ability and power. Can you see the difference in the more modern translations of this passage and the translation from the original Greek language? I am not saying that any of them are the right interpretation or the wrong interpretation. And we must ALL be careful not to fit Scripture to our theology [and personal view of God]. Instead, we should endeavor to fit our theology [and view of God] to Scripture. But when it is not clear -- when we do not know exactly what the thorn is, and God does not make it clear why He did not heal Paul -- we are left with these mysteries and opportunities for the Enemy to corrupt our understanding -- and it is hard to come to a definitive understanding. I am not trying to convince you either way, but I think it is important that we take note of all the interpretations and pray for revelation from God -- seek the mind and counsel of God to strip away our man-made doctrines, our traditions, and our sacred cows so that we might know His Truth in this matter. In the end, perhaps this old adage will sum up your conclusion: A man convinced against his will, is of the same opinion still. But, at the very least, I hope this discussion will encourage you to do a deep study of the Word. I think it is no accident that God made this passage somewhat vague and difficult to understand. Those with a heart willing to be transformed by the supernatural power of God, will hunger to seek more of Him. We can agree to disagree, and we can debate in love. In the end, we are seeking Him, and His Kingdom will be blessed. Ephesians 3:20-21 "Now to Him who is able to do far more abundantly beyond all that we ask or think, according to the power that works within us, to Him be the Glory in His Church, in Yeshua, and throughout all the generations to come". Belle, I couldn't agree more with your assessment. Paul was walking in incredible power and authority but his biblical track record for healing seems tepid. I think what we are seeing is his failure to go after the problem thorn with his own authority. God is content to allow him to keep it and glorify himself in the suffering. This message is hard to bear through our theological glasses but Jesus had transferred Power and Authority to his apostles and disciples and these weapons are available to Paul. We can only go by what the text gives us, but it seems clear Paul ask God to take the thorn and doesn't remove it with his own power. T.L. Osborn once said "You should never ask God to do what he has said He's already done, and you should never ask God to do what he has told you to do" This statement is rooted in the principle that God has given us the means to deal with satan's plans and will not handle what has already been dealt with. Trying to get the church to believe such a concept is a different matter! Wow! I wish I had said that! You have added a clear and concise concept that I believe is upheld in Scripture. I hope everyone who tunes in to read today's post will take the time to read your comment. And, yes, if the Church could understand this Truth, then the Enemy would have far fewer victims, and more Christians would have testimonies of victory in their lives! I have always taken it to mean that the gift of Grace trumps everything! I believe that the following Scripture shows how His Grace can work with the Power and Authority He has given us: "And so, from the day we heard, we have not ceased to pray for you, asking that you may be filled with the knowledge of his will in all spiritual wisdom and understanding, 10 so as to walk in a manner worthy of the Lord, fully pleasing to him: bearing fruit in every good work and increasing in the knowledge of God; 11 being strengthened with all power, according to his glorious might, for all endurance and patience with joy; 12 giving thanks to the Father, who has qualified you to share in the inheritance of the saints in light. 13 He has delivered us from the domain of darkness and transferred us to the kingdom of his beloved Son, 14 in whom we have redemption, the forgiveness of sins". In this passage we see both His Power in us (being strengthened in all power, according to His glorious might) and His Grace (having been qualified to share in the inheritance of the saints, and delivered from the domain of darkness and transferred to the Kingdom of His Son). Can God, through His Grace, heal us and deliver us from evil on His own? Yes, if He so desires, and it is to His own Glory. But when we use the Authority and the Power [that Jesus transferred to us] to defeat the Enemy, WE Glorify HIM! And that strikes a serious blow to Satan's battle plan and his reputation to "steal, kill, and destroy". It was with God's Grace towards us that Jesus told us, "I have given you authority to tread on serpents and scorpions, and over all the power of the enemy". What a powerful combination! This was a really good post and really started to make me think. 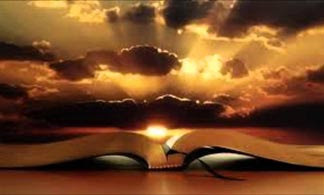 Im having to decide what my biblical view is going to be and thats a good thing. Thank you for making me really think about what I believe now and in the future! That is exactly what I want to accomplish -- not to tell you to believe as I do, but to encourage you to dig into your Bible and see what God is telling you. He really does want to speak to you personally and intimately, and sometimes I think Satan has introduced a spirit of Religion into the Church that comes between us and God. I truly believe you will get closer to Him as you immerse yourself in His Word!